Interview series: Ambassador Zvi Mazel: Jews are mainly represented in cartoons wearing black coats and hats with large hook noses and forelocks. A 2012 video shows Morsi saying amen to imam calling on Allah to destroy the Jews - not Zionists. “Anti-Semitism and what might be called anti-Israelism have intermingled in Egypt for many decades. Attacks on Israel often use the most depraved anti-Semitic clichés. Israel and the Jewish people are also attacked separately, even though many Egyptians consider Israel and the Jews as one and the same. 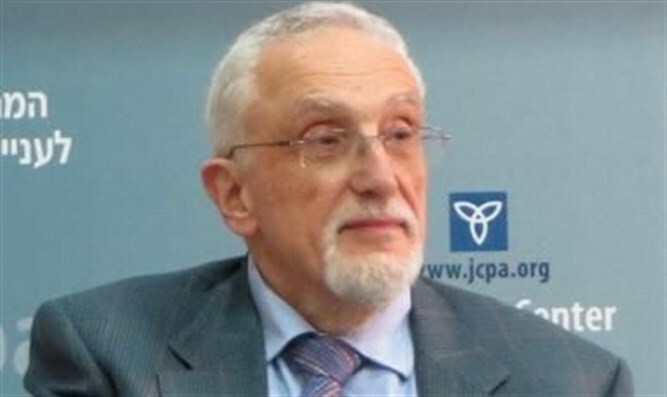 Zvi Mazel was Israeli Ambassador to Egypt from 1996-2001. He also served in Rumania and Sweden. He is now a Fellow of the Jerusalem Center for Public Affairs monitoring Arab issues. “One occasion when targeting of all Jews came to light internationally, was during the historic visit of Pope John Paul II to Egypt in 2000. The government owned English language daily, The Egyptian Gazette published a front page editorial titled, ‘Who Needs an Apology?’ It referred to the absolution of the Jews by the Vatican for the murder of Jesus. According to Editor-in-Chief Ali Ibrahim, this absolution erased all of the history, prayers and rituals of 2000 years of Christianity. He inferred that the United States had pressured the Vatican to absolve the Jews in order to strengthen Israel. “Under Mubarak, there was a great deal of state ownership of the media and other papers were severely censored. It was forbidden to criticize the President, the Armed Forces and the treatment of the Coptic minority. As far as Israel and the Jews were concerned, it was however permissible to attack and defame them relentlessly. Islamic newspapers took their cue from the official line and their messages of Israel-hatred and anti-Semitism were vitriolic. “Another important hate-theme is the presentation of Jews as the root of all evil and a threat to global peace. Such articles are often based on the Protocols of the Elders of Zion, blood libels or even texts from the Talmud. Much respect was given to prominent French Holocaust denier Roger Garaudy who died in 2012. The initiative taken by then-Swedish Prime Minister Gunnar Perssson to hold an international conference on Holocaust education in 2000 was forcefully denounced in Egypt. These are just a few examples among many. “The rise to power in Egypt by the Muslim Brotherhood brings to the fore a movement in which Jew-hate is inherent. This organization was founded in 1928 in Egypt by a school teacher, Hassan Al-Banna as a Pan-Islamic Movement. It developed a Muslim version of Nazi anti-Semitism. It saw to it that Hitler’s Mein Kampf was translated into Arabic under the title ‘My Jihad.’ Other Nazi anti-Semitic publications were also translated. Cartoons found in the Nazi hate paper Der Stuermer were changed to present the Jews as the satanic enemy of Allah, rather than of the German people. Writer and theorist Sayyid Qutb was a leading authority of the Egyptian Muslim Brotherhood in the 1950’s and 1960’s. In his popular anti-Semitic book My Battle with the Jews, he claimed that Jews infiltrated and corrupted Islam.